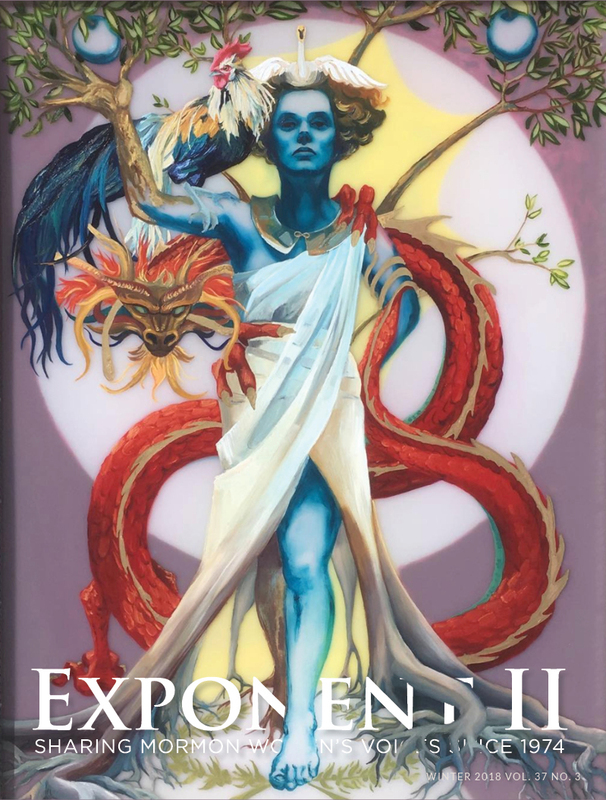 It’s Time to Subscribe to Exponent II! The following is the letter from the editor for the Winter 2018 issue of Exponent II. This issue was our annual writing contest and the contest theme was spiritual foremothers. If you would like to receive a paper copy of this issue (and you really do–the artwork in this issue is jaw-dropping), you need to subscribe here by January 20. The cover art is “Divine Feminine” by Aerin Collett. Whoever develops the algorithms for internet advertising knows that I am a total sucker for anything that will teach my daughter about the powerful, smart, creative, brave women who went before her. Show me anything that teaches about Marie Curie, Sojourner Truth, Frida Kahlo, and Ruth Bader Ginsberg and I will basically beg you to take my money. At my daughter’s last birthday, as she opened Exponent II’s Illuminating Ladies coloring book (available at www.exponentii.org/shop), Good Night Stories for Rebel Girls, and a pack of Ashley Mae Hoiland’s We Brave Women cards, my father-in-law laughed, “Looks like Margaret picked out the presents this year.” Yep. The truth is, I feel almost a frantic need for my daughter to know about these women. Exponent II subscribes to the idea that knowing history and keeping a record of women is crucial. It’s a big part of the reason that we continue to publish a magazine in print: we want there to be a lasting record of what Mormon women were thinking and experiencing during these times. We also look back to the authors and editors of The Woman’s Exponent for guidance and inspiration as we write and publish. Through the magazine and the retreat, women connect to the Exponent II founding mothers. Our organization has a strong sense of the importance of history and legacy. It was that sense of legacy and inheritance that brought Pandora and me to the idea of doing our annual essay competition on the theme of spiritual foremothers. While we all heirs to the work and words of the women who have gone before us, too often those women’s stories go untold. They are marginalized to the sidebars of history textbooks, thought of as peripheral to the narrative, or reduced to caricatures of a stereotyped female: the mother, the starlet, the wife, possibly the altruist. We wanted to bring those ignored or reduced women into the spotlight, showing off their complexity and strength through telling the stories of how they have affected women today. We wanted to hear about spiritual foremothers who came in the form of family members, mentors, women from scripture, fictional characters, or history. We asked the question: How have these women changed your life? The pages of this issue hold the stories of a professor, a mother, an accused witch, a poet, a midwife, a grandmother, a cartoon character, an awakening feminist and more. Just as importantly, they hold the stories of how those women affected the women writing today. “Irene” weaves together the story of a Mormon midwife who perished on the Titanic with a modern-day miscarriage; “What It Is to Be a Witch” tells of how a woman who was killed in the Salem witch trials inspired her ninth great-granddaughter to live a life of courage. In “The Things We Have Not Said,” Kayla Roundy looks at a painful family relationship and how the conversations that do not happen can be just as influential as those that do. We feature the art of Megan Knobloch Geilman, who has reimagined famous works of art as women from Mormon history and scripture. Her series “Works of Translation” reminds us that telling the stories of our foremothers allows them to live again in a new way. The winner of this year’s essay contest, Rachel Rueckert, writes in “Wonder Women” about how a simple costume helped get her through one of the hardest times of her life, and how a graphic novel character exposes our yearnings for the feminine divine. This issue’s cover, Divine Feminine by Aerin Collett, reminds us of the powerful women from history and of the women we can become. The rooster on her shoulder is a symbol of honesty, fidelity, and bossiness (an adjective that seems to be uniquely applied to commanding women). The swan is a token of grace and beauty. And the dragon wrapped around the woman stands for power, strength, and luck for those who are worthy. The goddess seems ready to partake from the tree of knowledge, but she also is that tree–both good and evil, a complex and nuanced woman who is capable of greatness. We all stand on the shoulders of women who have gone before us. Some of them have been forgotten by history. Some are just beginning to be recognized for the labor they have done. If we want our children to benefit from the work and wisdom of our foremothers, we need to tell their stories. We need to search for traces of them in our own lives, to track what we have inherited and give credit where it is due. Without that work, we quickly begin to take for granted what was once hard-won. We return to the beginning of discussions and issues again and again, unaware of the conversations that have already happened. And we lose the gift of anchoring our lives to those who stand ready to stand as guideposts as we navigate the questions, doubts, and problems that face us. May our hearts be turned to the mothers. 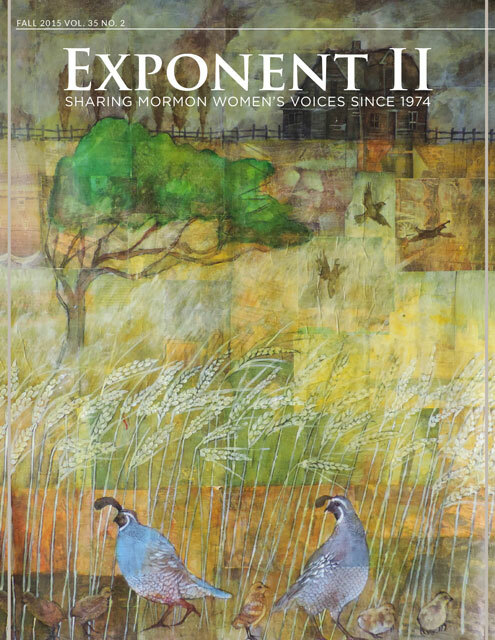 To subscribe to Exponent II, go here. Hi Lynda! You can subscribe by mailing a check to 1200 E. 36th St. Baltimore, MD 21218. Make sure the check is made out to “Exponent Women Co.” Thanks for subscribing!